Cystic fibrosis (CF), a life-threatening multiorgan genetic disease, is facing a new era of research and development using innovative gene-directed personalized therapies. The priority organ to cure is the lung, which suffers recurrent and chronic bacterial infection and inflammation since infancy, representing the main cause of morbidity and precocious mortality of these individuals. After the disappointing failure of gene-replacement approaches using gene therapy vectors, no single drug is presently available to repair all the CF gene defects. The impressive number of different CF gene mutations is now tackled with different chemical and biotechnological tools tailored to the specific molecular derangements, thanks to the extensive knowledge acquired over many years on the mechanisms of CF cell and organ pathology. 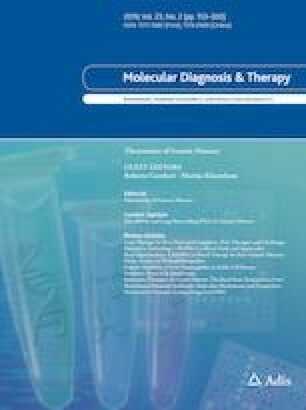 This review provides an overview and recalls both the successes and limitations of the different experimental approaches, such as high-throughput screening on chemical libraries to discover CF gene correctors and potentiators, dual-acting compounds, read-through molecules, splicing defect repairing tools, cystic fibrosis transmembrane conductance regulator (CFTR) “amplifiers,” CFTR interactome modulators and the first gene editing attempts. The author is grateful to many colleagues in Europe, the USA and Canada, but is strongly in debt to those in his research group, particularly Maria Cristina Dechecchi and Anna Tamanini for daily scientific discussions over many years. This review is dedicated to Rossella Rolfini, who prematurely left her beloved friends and colleagues, leaving us alone with our dream of the final cure for the patients affected by CF. This review was made possible by the support of different research projects with grants from the Telethon Foundation, CariVerona Foundation and Italian Cystic Fibrosis Research Foundation (FFC no. 17/2010, 1/2011, 5/2011, 1/2012, 1/2013, 8/2014, 17/2014, 9/2015, 1/2016, and 3/2016).